Fall came to the prairie in the middle of the night. 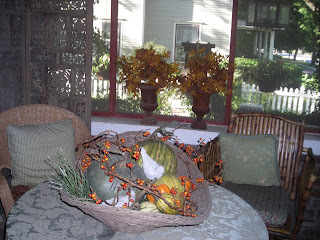 But it came to Linderhof last week for with the cooler weather, I got inspired to decorate the house for fall. Bowls are filled with pumpkins and gourds while vases are filled with bittersweet and leaves. 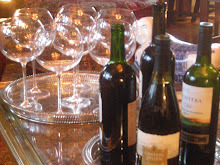 Silver pheasants and quail come out of hiding to grace tabletops as well. The coffee table is large and I love the big blue and white bowl. 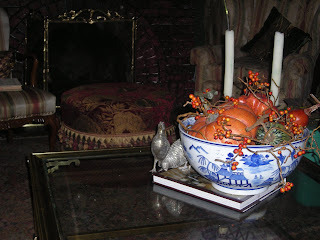 Filled to the brim with colorful pumpkins entertwined with bittersweet and a pair of shy silver quail bring fall to the living room. 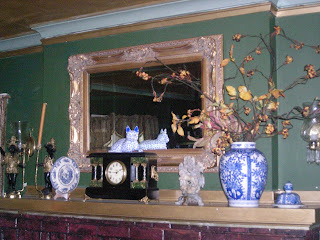 The ginger jar on the mantle gets big branches of bittersweet and some leaves -- it's not so much an arrangement as branches just plunked down into the jar. Even the screened in porch gets it share of pumpkins and bittersweet and the summer annuals in the iron pots get replaced with autumn leaves. 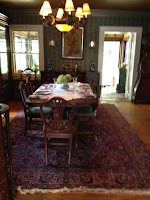 These silver quail are always on the breakfast room table. A last year Christmas gift from dear friends but they make the breakfast room especially fallish with their presence. 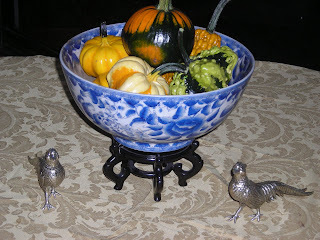 Mini gourds and mini pumpkins from the farmer's market fill another blue and white bowl. At the top of the stairs, it feels like fall with the branches in the blue and white vase. I think I love fall decorating so much because the colors of fall fit in so well at Linderhof -- the golds and oranges and rusts and sagey greens go well with Linderhof's gold and deep green colors. Linderhof, in my opinion, wears fall very well. 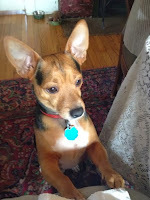 This week, I shall go to the pumpkin farm for a passel of pumpkins for both the front yard and the back garden. A trip, too, to the mum farm for mums for next year's garden as well as a few choice plants for the back garden and the front yard. When the leaves start to turn in a week or so and with the piles of pumpkins around the front and a couple of well placed mum plants, it will definitely look like fall on the prairie. I am enjoying your photos and post about your Fall decorating. 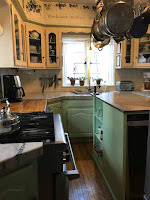 I always do the same but this year am packing up everything in my downstairs for our kitchen redo and floor refinishing. Hopefully I will be able to take out my Fall decorations briefly for Thanksgiving. Until then I am thoroughly enjoying your photos Martha. Fall is one of my favorite times of year also and here in N FL we are beginning to have the leaves fall and cooler temps. I will do some Fall decorating outdoors with some pumpkins sitting on and around my front garden bench and front porch.